On the basis of the immunogen sequence, we would expect this antibody to recognise the following isoforms of Cenexin1/ODF2 as listed in Swissprot: Q5BJF6-1 (95 kDa), Q5BJF6-2 (89 kDa), Q5BJF6-3 (93 kDa), and Q5BJF6-4 (95 kDa). Synthetic peptide conjugated to KLH derived from within residues 750 to the C-terminus of Human Cenexin1/ODF2. This antibody gave a positive signal in Hela whole cell lysate and MCF7 whole cell lysate. Our Abpromise guarantee covers the use of ab43840 in the following tested applications. Seems to be a major component of sperm tail outer dense fibers (ODF). ODFs are filamentous structures located on the outside of the axoneme in the midpiece and principal piece of the mammalian sperm tail and may help to maintain the passive elastic structures and elastic recoil of the sperm tail. May have a modulating influence on sperm motility. Functions as a general scaffold protein that is specifically localized at the distal/subdistal appendages of mother centrioles. Component of the centrosome matrix required for the localization of PLK1 and NIN to the centrosomes. Required for the formation and/or maintenance of normal CETN1 assembly. Testis-specific (at protein level). Highly expressed in cytoplasm of step 2 round spermatids. Detected in the middle piece and extends to about half the principal piece of the sperm tails. Belongs to the ODF2 family. Cytoplasm > cytoskeleton > centrosome. Cell projection > cilium. Cytoplasm > cytoskeleton > centrosome > centriole. Cytoplasm > cytoskeleton > spindle pole. Localized at the microtubule organizing centers in interphase and spindle poles in mitosis. Localized at the distal/subdistal appendages of mother centrioles. ab43840 staining Cenexin1 in the mother centriole of a dividing HeLa cell by ICC/IF. DNA is stained blue, Aurora A is stained red, and Cenexin1 is stained green. Cells were fixed in formaldehyde, permeabilized with 0.1% Triton in PBS, and blocked with 2% BSA for 1 hour at 21°C. The primary antibody was diluted 1/200 and incubated with the sample for 1 hour at 21°C. A FITC-conjugated anti-rabbit IgG H+L antibody was used as the secondary. Immunocytochemistry/ Immunofluorescence - Anti-Cenexin1/ODF2 antibody (ab43840)This image is courtesy of an Abreview submitted by Kirk McManus, Univ. of Manitoba/Cancer Care MICB. Immunocytochemistry/ Immunofluorescence analysis of human HCT116 cells labeling Cenexin1/ODF2 with ab43840 at 1/400 dilution. Cells were fixed in formaldehyde and permeabilized with 0.5% Triton X-100 in PBS. Staining with ab43840 at 1/400 was carried out for 1 hour at 22°C in PBS buffer. ab150081, a Goat Anti-Rabbit IgG H&L (Alexa Fluor® 488) preadsorbed secondary antibody was used at 1/200 dilution. 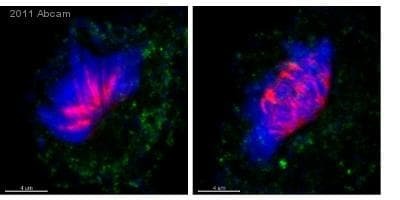 DAPI was used to counterstain. 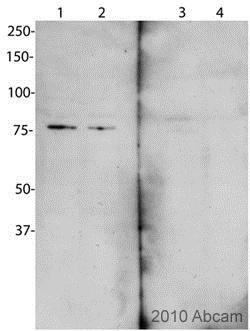 Western blot - Anti-Cenexin1/ODF2 antibody (ab43840)Image courtesy of an anonymous abreview. Observed band size: ~75 kDa why is the actual band size different from the predicted? Detection of Cenexin 1 by ab43840 in Western blot of HeLa cell lysates. Please see anonymous abreview for further details. Publishing research using ab43840? Please let us know so that we can cite the reference in this datasheet. 1. Are you staining fixed tissues (i.e. paraffin-embedded or frozen) or cells? What is the fixative used and fixation protocol? I it was tissue fixated in 3.7% paraformaldehyde for 30'. 2. Is there a reason why you used this antibody instead of one of our centrosome markers like Ninein or Gamma tubulin? Ref1), I needed to resolve this particular structure within the basal body. 3. According to SwissProt, the tissue specificity for this protein is testis-specific (at protein level). We also list HeLa cells as a positive control. Have you tested any of these controls? I am currently awaiting the results of this experiment and may contact you again once we get them. 4.What had you tried for blocking? 5. What was the dilution of the primary antibody used? The antibody was used in 1:200 dilution. At this dilution the antibody gives an excellent bright signal with almost no background, but the protein, which it recognizes, is localized most likely within the cilia axoneme, (above the apical cell surface) , and totally absent from the centrosomes, which are localized in the apical surface . It is unlikely that blocking may change this fact. 1. Cell. 2012 Jan 20;148(1-2):189-200. Coordinated ciliary beating requires Odf2-mediated polarization of basal bodies via basal feet. Kunimoto K, Yamazaki Y, Nishida T, Shinohara K, Ishikawa H, Hasegawa T, Okanoue T, Hamada H, Noda T, Tamura A, Tsukita S, Tsukita S.
Thank you for your reply and for providing this additional information. Unfortunately the attachment didn't go through. Could you send it again compiled as 1 PDF, PPT, or DOC file? Please let me know what the results are for your control experiments. Right now it is difficult for us to determine why the antibody isn't working since the application IHC-P hasn't been tested and the tissue type is not validated. If you could run a positive control WB with HeLa or testis lysate, that would provide us with important information about whether or not the antibody is working. We look forward to hearing more information about the positive control. Hello, With an aim to localize basal bodies/centrosomes in mouse trachea ciliated cells I have purchased recently the antibody to Anti-Cenexin1/ODF2 (ab43840). However, as it was shown on Fig1 , this Ab does not recognize centriole/ basal bodies in mouse trachea in IH experiments ( secondary antibody-anti rabbit Alexa A568 red , green –actin). It appears that Ab 43840 recognizes protein localized in cilia axoneme ,well above the cell apical surface , as it could be seen on the orthogonal view of the image shown on Fig 2. I ended up using the antibody purchased from Sigma that does recognize centrosomes, as it is shown on Fig 4 . 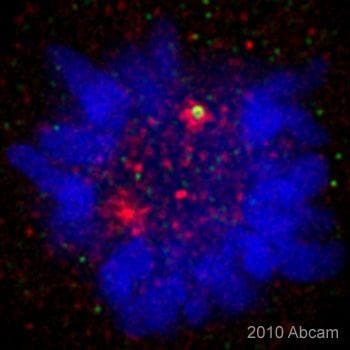 For I cannot use the Ab 43840 for localization of centrosomes, as it was supposed to recognise , it renders it useless for my study . I would like ask you to issue me a credit to buy another antibody from your catalog that I can use for other aspects of my research . I hope that you find my request reasonable . Thank you for contacting us. I am sorry to hear that this antibody is not providing satisfactory results. The details provided will enable us to investigate this case and will provide us with vital information for monitoring product quality. You said that you're staining mouse trachea ciliated cells. Are you staining fixed tissues (i.e. paraffin-embedded or frozen) or cells? What is the fixative used and fixation protocol? According to SwissProt, the tissue specificity for this protein is testis-specific (at protein level). We also list HeLa cells as a positive control. Have you tested any of these controls? Was the antibody that worked from the other vendor also to this target protein, or was it to a different protein? Is there a reason why you used this antibody instead of one of our centrosome markers like Ninein or Gamma tubulin? What had you tried for blocking? What was the dilution of the primary antibody used? Thank you very much for arranging everything, it's much appreciated. The attached pdf has details regarding the Ab and some images. Thank you very much for providing that information for me. It will be very helpful to us. I have just had a look at the status of your order of ab43840 and it has been shipped today so will therefore be with you tomorrow as I said. Please do let me know how you get on with this antibody. Until then, I wish you all the best with your research. Thank you very much for the reply and am happy to know that you will able to provide me with an alternative. I will be happy to send you images and additional details ASAP. I have now arranged for the new vial ofab43840 to be sent out to you. This is on the order number 1097435(Purchase order number FOCR 303778). This should get to you tomorrow. If you have any problems receiving it please dolet me know. As mentioned in my previous email, it would be very useful for us to look into the problems you have had with ab72505. To this end, if you could share with me the protocol details and some images of the results I would be very grateful. If you encounterany further problemswith the new antibody ab43840 please dolet me know. I look forward to receiving your reply. Has been stainingcentrioles but sees no differentiation between mature and non-mature as should be seen with this ab. Thank you for contacting us yesterday and sorry for the delay in getting back to you. I was sorry to hear that youhavebeenhavingdifficulties with the anti-CEP170 antibody(ab43840). We take product complaints very seriously, and investigate every product that we feel may not be performing correctly. >Once I have this confirmation I will arrange for the antibody ab43840 to be sent out to you. I understand the problems you have encountered with this antibody and the optimisation you have had to perform in trying to make it work as expected. If possible, so that I can investigate this case further with thelab, would you be able to give me a little more detail about the experiment carried out? If you wouldn't mind could you please fill out the questionnaire I have attached to this email, including any images you have if possible. This information will also allowme to investigate this case internally and initiate additional testing where necessary.